Today's article is about several men and women, young and old, who left a Newark legacy. We start with a college professor, a dean of Newark's Baptist community, an engineer and preservationist, an educator and labor leader. Next Thursday we will remember a civil rights leader, newspaper reporter and editor, a political analyst and statesman and a deputy mayor who became a jail warden. Each will be truly missed, and while this list of Newark community servants and role models is in no way complete, it is a good example of the accomplishments of some fine people who cared and shared their best attributes with their hometown. Dr. J. Thomas Flagg, late husband of Dr. E. Alma Flagg, was born in Georgia and began his teaching career in Englewood, where he remained for 10 years before joining the Newark school system. He was employed by the Newark district from 1951 to 1971 as an elementary school teacher, secondary science teacher, head of a science department, vice principal, summer school principal and director of secondary education. In 1972, he joined the faculty of Montclair State College, where he became professor of education. During his professional career, he served as an education consultant in Newark and Philadelphia, coordinated Newark's South Side Project in the early 1960s and was director of the nation's first Neighborhood Youth Corps from 1964 to 1965. He also was a proposal evaluator for the National Teachers Corp. and the National Science Foundation in Washington. Within the Newark community, Flagg was a trustee of the Newark Boys' and Girls' Clubs, ruling elder and treasurer of the Elizabeth Avenue-Weequahic Presbyterian Church and trustee of the Center for the Performing Arts. He also was a director on the board of the Interracial Council for Business Opportunity of New Jersey and a lifelong member of the NAACP. For service to his community, Flagg was awarded the Essex Civic Service Award, the Outstanding Educators of America Award and the Boys' Clubs of America 25-year Service Award. He also was named to Who's Who Among Black Americans. Newark was particularly fortunate to have had such a distinguished, talented and generous leader. Dr. Benjamin Franklin 'B.F.' Johnson Sr. passed away at 95 in 1992. While he came from the old South, it was here in Newark, beginning in 1943, that he rose to prominence. Born in Virginia as a son of a former slave, he attended Hampton Institute in his native state, and later Benedict College and Howard University. Early in his career, he served as pastor of several churches in Goldsboro, N.C., and was director of rural education in association with Shaw University. He also worked briefly as a prison chaplain. After arriving in Newark, he soon drew huge crowds to his church. Within a short time, loudspeakers were installed for the overflow who stood outside to hear his sermons. Eventually, Metropolitan Baptist Church's congregation grew from hundreds to thousands. According to a 1992 anniversary booklet, the membership at its crest exceeded 5,200. Johnson's great popularity was attributed to his 'no-nonsense personality, ' his dynamism and his ability to tell you everything there was to know about the Bible. On the minister's 90th birthday, Robert Queen, editor of the New Jersey Afro-American newspaper, remarked, 'While his pastorate probably stands among the longest in the Newark area, there is no question as to the impact Rev. Johnson has made upon the city and the Baptist churches.' Johnson did not limit his work to his congregation. He was co-founder of the North Jersey Committee of Black Churchmen, president and founder of the Black Ministers' Council of New Jersey, served on the Home Mission Board of the National Baptist Convention, and was former president of the New England Baptist Convention. In the 1960s, he said that 'the dreams of Dr. Martin Luther King Jr. were also mine, as were his beliefs in humanity. I trod in the mud with Dr. King in Selma, and walked with Adam Clayton Powell during the famous March on Washington.' In 1970, he lost his wife of 51 years, Nellie Dixson Johnson. He later married Charlotte Bell Johnson, who once was quoted as saying, 'There's never a dull moment. It's been very interesting to work alongside such an outstanding minister and leader.' Johnson's dream was to see the completion of the great new building of the Metropolitan Baptist Church. Instead he lay in state there on the eve of its completion. Dorland J. Henderson was born in North Carolina in 1898. When he was young, his family moved to Indianapolis, where he was raised by parents who valued a good education, hard work and self-sufficiency. His life-long love of working with his hands and quoting long passages from the Bible and English literature can be attributed to his mother and father. 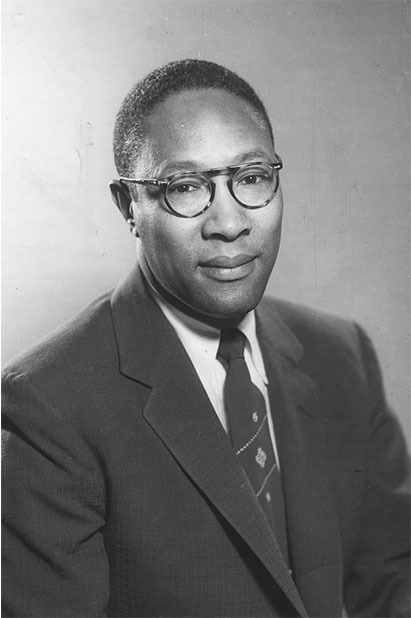 Henderson was the first black graduate of the Purdue University Engineering School. After World War I, he went to work for the Pennsylvania Railroad and later for the New Jersey Highway Department, where he became chief engineer of the Electrical Division. At that time, New Jersey was one of the nation's leading road traffic-safety states, developing the cloverleaf, median dividers for major highways, luminous paint for night driving and 'low-level lighting.' Henderson was responsible for this latter development, a request of Dwight Palmer, the department's well-known director. Bridges and roads were to be illuminated at waist or curb level, not by overhead lights. For many years, this new technique was popular around the country and beyond. It amused Henderson to get a request for help from as far away as South Africa. Many other phases of the life of this scholarly, classics-quoting engineer stand out. Henderson was noted for his attention to local politics, especially his critiques of City Hall operations. His three-minute 'essays' presented before the Newark municipal council at regular meetings were published in 1986 as a booklet, 'Comments on Government of the City of Newark, 1972-1985.' Henderson and his wife, Elizabeth, devoted their lives to the preservation of a great 18th-century home. From the late 1950s until his death last year, they continued to restore Sydenham House, off Branch Brook Park on 'The Old Road to Bloomfield, ' to its original farm-like, country house status. All 18 rooms were lovingly restored, the windows re-glazed, the stone wall replaced, the ridge pole reinforced, and hundreds of gallons of linseed oil used to remove more than two centuries of paint to expose the building's original pine, oak and cherry surfaces. The SWIM room (sewing, weaving, ironing and mending) is now silent. Dorland Henderson's death precipitated phase two of the couple's plan—to eventually transfer Sydenham House to the Newark Museum as a permanent record of Newark's early days. Clara Dasher (1930-95) began her career as a Newark elementary school teacher. Active in the Newark Teachers Union for more than two decades, she also became the longtime president of the Essex County College board of trustees. Although she was born in Jersey City and lived in East Orange, she is perhaps best known for her Newark-based educational activities—as a teacher and college trustee. At the college, colleagues said, she made a difference because she was known for getting things done. Before becoming a trustee, she taught in Newark schools from 1959 to 1973 and was vice president of the teachers union. Dasher's professional involvement included service on the Governor's Commission on Public Responsibility for Educational Success and on the state Martin Luther King Commemorative Commission. She also was the longtime president of the New Jersey A. Philip Randolph Institute, named for the great labor leader who headed the Brotherhood of Sleeping Car Porters.